This is a Pampered Chef recipe which comes from their “Casual Cooking Easy Recipes for Indoors and Out” cookbook. It’s really easy to make (seems like I always say that but it’s true) and yummy (I always say that too but it’s also true, I would tell you if it wasn’t)! 1 Cook pasta according to package directions, drain and keep warm. 2 Meanwhile, dice tomatoes and chop onion. Slice zucchini. 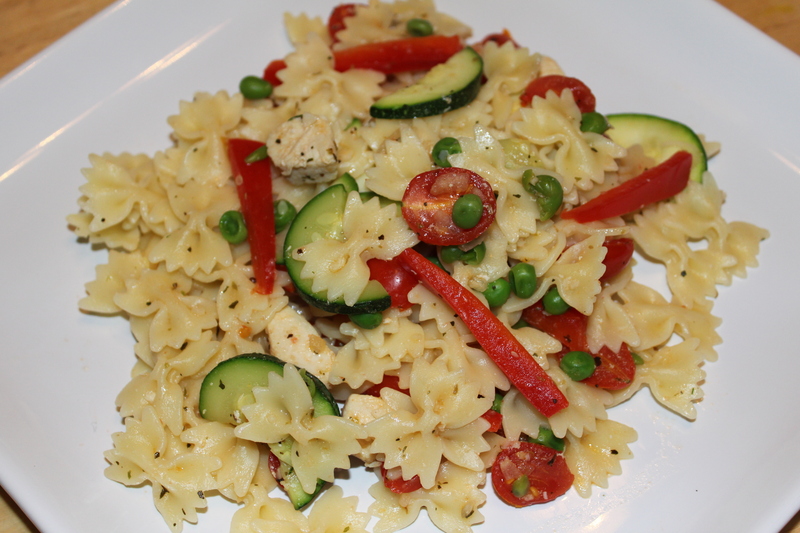 Cut bell pepper into thin strips and chicken crosswise into 1″ strips. 3 Heat oil in skillet over medium high heat until hot. Press garlic into skillet then add chicken. Stir fry 5 minutes or until chicken is no longer pink, stirring occasionally. Reduce heat to medium. Add onion, zucchini, bell pepper, peas, seasoning mix and salt and stir fry 2 minutes. Add tomatoes and heat 1 – 2 minutes, stirring gently until heated through. Remove from heat. 4 Stir in warm pasta. Grate Parmesan cheese over pasta. Once again, a very tasty and healthy meal. Thanks Penny!